DeWALT are giving away up to 3,000 18V XR Brushless Naked Combi Drills (DCD796NT-XJ) until 30th November 2018. 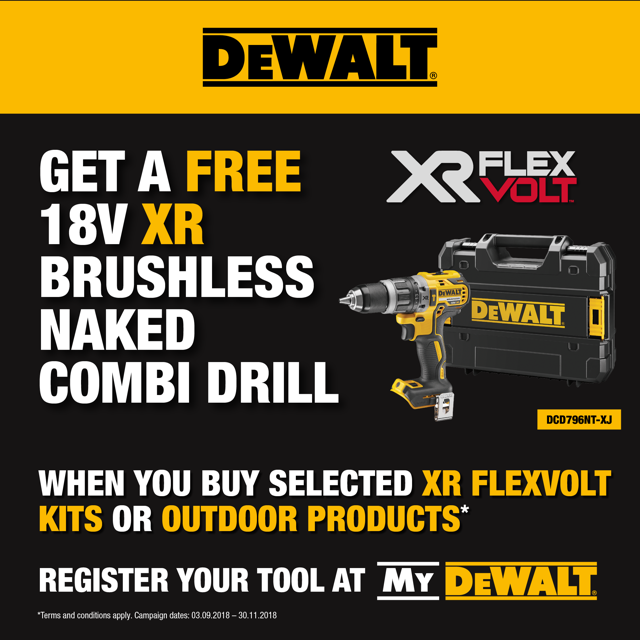 To qualify for the free tool, you must purchase a DEWALT XR FlexVolt 54V kit (T2) with 2 x batteries and charger (new, not second hand) or a DEWALT XR FlexVolt 54V outdoor product between the 3rd September 2018 and the 30th November 2018. Please note, claims for products purchased before or after this promotional period will be deemed invalid. You may only redeem one and you must provide proof of purchase and submit your claim to DeWALT here. This offer is while stocks last and is run by DeWALT, not Elliotts. Full T&Cs can be found on their website.